Our wish to you is for a most joyous and fruitful New Year. Our industry, although far from immune to the economic doldrums affecting the global economies, has a resiliency we should all be most thankful for, and to that end, with the proper attitudes and earnest work, all should see a continuing recovery in 2010. 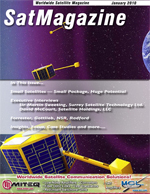 SatNews Publishers is most thankful for your continued support and if we can do anything to assist you with your endeavors as far as content is concerned, please contact us and let us know of your interests. Thank you! Despite the perception that space is a growing market the actual number of satellites launched each year has been falling over the last 20 years from around 140 per year in the early 1990s to around 100 per year in recent years. Whilst the total number of satellites has been falling its interesting to note that the number of small satellites  defined as less than 500kg  has remained fairly constant at about 30 per year. We make no excuses for returning so speedily to the position of Sirius-XM and its would-be European imitator Ondas Media. The news concerning the prospects for an international version of Sirius grew considerably during December as Sirius CEO Mel Karmazin as well as his 40 percent shareholder Liberty Media confirmed they were looking closely at international options. Iridium just announced the sale of its 1,000th OpenPort system, making it the de facto leader in the 128 Kbps targeted segment of the maritime communications market. Since its introduction, the inexpensive 9.6/32/64/128 Kbps voice and data service with its convenient, small antenna has enjoyed wide acceptance. The satellite industry, NSR included, has not been shy in recent months about trumpeting the relative success the sector has had in sliding through the recent global economic turmoil relatively unscathed. It is certainly true that the satellite industry as a whole has managed continued strong growth in the face of the worst economic crisis since the Great Depression of the 1930s. Still, the world relative is key because there have been some signs of weakness in a few key markets with North America, interestingly, seeing perhaps the greatest negative impact of any region from the point of view of commercial satellite operators operating therein. As is the case for many writings of wisdom, the Satcom Chronicles contain a section designed to prepare one for the treacherous trek from entry-level obscurity to a higher position of prosperity and perhaps even an office with a window. These writings warn us of a sinister tool often packaged as a vehicle for success, but sometimes implemented as way for management to trap those with ideals of ambition and weed them from the flock. Executive Spotlight  Professor Sir Martin Sweeting, Chairman + Director Surrey Satellite Technology Ltd. Serving as both the Chairman and as a Director of Surrey Satellite Technology Ltd. (SSTL), as well as Director of the Surrey Space Centre (SSC), Sir Martin Sweeting has been honored on numerous occasions for his work that pioneered the concept of rapid-response, low-cost and highly-capable small satellites using modern terrestrial COTS (commercial off the shelf) devices to change the economics of space. In 2008, David C. McCourt formed Satellite Holdings, LLC, a partnership between private investment firms McCourt Capital, LLC and The Edgewater Funds. Since then he has begun a series of high-profile acquisitions to found Skyware Global  the worlds first total solutions provider of antenna systems. Here he gives us his industry predictions and explains why Skyware Global is well-positioned to support future growth. As we enter the New Year satellite industry event calendars quickly fill up with the most promising and business-enriching trade exhibitions such as SAT EXPO EUROPE 2010 at Fiera Roma (Rome Fair) from February 4th through February 6th. Focus  Orbital Sciences, TAURUS® II  Rocketing Ahead, by Baron Beneski, Vice President, Orbital Sciences Corp. The successful test firing of the CASTOR® 30 second stage motor for Orbital Science Corporations Taurus® II space launch vehicle on December 9th marked the beginning of a year-long systems testing campaign that will lead to the rockets first flight in early 2011. The solid-fuel second stage motor, which is supplied to Orbital by ATK Space Systems of Magna, Utah, was test fired for approximately 150 seconds, producing 72,000 lbs. of maximum thrust. In order to accurately test the motor performance in flight conditions, the static fire test was conducted in a vacuum chamber at the U.S. Air Forces Arnold Engineering Development Center (AEDC) which simulated the upper atmospheric conditions at altitudes in excess of 100,000 feet where the motor is designed to ignite. The Space Foundations 26th National Space Symposium, set for April 12-15 at The Broadmoor Hotel in Colorado Springs, Colorado, is where all sectors of the space industry gather together to share perspectives and get down to business. Interorbital Systems (IOS), based in Mojave, California, is a rocket manufacturer as well as a small satellite developer. The Company recently announced the names of the teams and experiments slated to fly on the first orbital launch of the companys new modular rocket, the NEPTUNE 30. The cost implication of the broadband communication of volumes of data is well known as a most important issue for ship owners and operators. Applications such as Internet browsing, downloading email with attachments, obtaining electronic manuals, and weather and navigation data for bridge and other critical systems are all shore to ship (download) intensive applications crucial to operational efficiency and important elements of crew morale. Case Study  SES WORLD SKIES, The Kazakhstan Train Connection  All Aboard! Its early Sunday evening in Almaty, Kazakhstans biggest city. Hundreds of commuters, mostly business people, board a train at the National Railway Station for the overnight journey to the capital metropolis of Astana. Northwestern is one of the featured boats in the Discovery Channels smash hit show, Deadliest Catch, which documents the king crab fishing industry in the Bering Sea, and airs in over 150 countries. The show has made Skipper Sig Hansen famous, but fame doesnt make time at sea any safer, easier or more profitable. Femap enables more accurate and comprehensive analyses of satellite mechanisms, this in spite of development cycles that have been sliced in half.